As we posted earlier in the week, the City of Albuquerque’s plans to up transit spending are a waste of money. But, there is another major mass transit project operating in New Mexico that, while operational, is an enormous boondoggle. That is the Rail Runner of course. 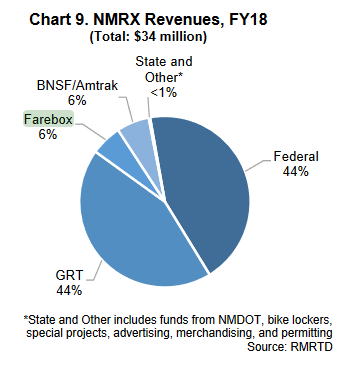 Basically, when taken as a whole, the sorry state of farebox collections among New Mexico’s transit projects SHOULD be clear indicator that, contrary to the fervent desires of the political class, New Mexico is just not a place where mass transit makes sense. Remember, transit projects across the country average 30% farebox recovery. The following chart is from the Legislature’s report on the Rail Runner. Of course, because the Rail Runner’s infrastructure costs far exceed those for buses, it is overall a worse investment, but the facts don’t like: spending money on transit in New Mexico is a waste. I was surprised that Amazon includes access to public transportation in its site selection criteria. Do other companies do this? And to repeat the comment by the RGF sponsored speaker, Mr. O’Toole, Railroader can be shut down at any time because almost no federal money was used in its original construction. It’s too bad the money spent on ART and RAILRUNNER will be lost, yet instead of someone saying OPPS! they keep shoveling money into it…like trying to push a dead mule uphill….